You are here: Home » Pom Poms!! Every couple of years a new miracle fruit comes onto the scene. I would say Acai is the current darling, but it was not too long ago that pomegranates had the halo on. I consider myself as having a rather broad experience with food. While not venturing into the truly unusual (from a midwestern US point of view), I feel that I have a good catalog of food that I have tried. One of the most common foods I really have not had much experience with is pomegranates. I’ve had dark chocolate pomegranate bits, which are made with pomegranate juice, but I have not really played with the fruit. No self-respecting food blogger can go very long with this hole in his resume, so I sought out an interesting way to use it. I found that in a Mustard pomegranate Pork Tenderloin. I can tell you that pomegranates are not easily found in Cleveland in March. I looked in my grocery store and several farm markets, but to no avail. Luckily, I just needed some juice and seeds and not a whole fruit. The juice is no problem. POM has made it ubiquitous. Every juice aisle and produce section in America carries it. To get the seeds I needed to search a little more. I eventually found a package of the seeds in the produce section of a higher end grocery. The dish was very straight-forward. Keep an eye on the sauce, as it reduced more quickly than I was expecting. Because of that, I didn’t have much to baste with, so I saved it all for the end. The dish was good, but probably won’t make the rotation very often. I served it with a few chunks of fresh tomato, and a variation on an old low carb standby. Cauliflower mashed potatoes are fairly common in the low carb circles, and I love the added blue cheese flavor. Preheat oven to 350 degrees F (175 degrees C). Coat a large roasting pan with cooking spray. Remove tenderloin from marinade, reserving the marinade. Place meat in roasting pan, and arrange pan on center rack in oven. Roast tenderloin in oven for 30 to 40 minutes, basting lightly with reduced marinade until internal temperature is 155 degrees F (68 degrees C) when measured in the thickest part of the tenderloin. Remove tenderloin from oven, cover with foil, and let rest for 5 to 10 minutes before slicing. Serve each portion with reserved sauce drizzled over top, and a sprinkle of pomegranate seeds. Dice the cauliflower. Place diced cauliflower into a steamer and steam for 5 minutes or until very soft. Place cauliflower into food processor and blend until smooth, adding half and half and blue cheese. Process until the consistency of mashed potatoes. Serve with a few crumbles of blue cheese on top. thanks for checking out my blog! I love pomegranates! I’m kind of impatient though and it takes me forever to get the seeds out, so I don’t eat them all the time. Do you have any tips for speeding up the process, or is it best just to buy the seeds from a higher end grocery store? I have to admit that I have not removed the seeds myself (was hoping to for this recipe), so I am wondering if other readers may be able to supply tips! That is fantastic and a great strategy to help win the battle! This sounds super yummy, I am thinking about trying it with turkey instead of pork. Haven’t decided on the cauliflower yet, it sounds amazing but the blue cheese may add too much sodium for me. Maybe a variation, I love doing cauliflower mash. Looks good! I have only recently discovered pork tenderloin so am on the look out for new recipes. I will definitely have to try this one, thanks! Love pomegranate. Interesting way to use this great fruit. When you finally do get to remove pomegranate seeds, the best way to do it is to score the skin in quarters. Then break the fruit in half or cut it but you loose some pips by cutting them open. The seeds will pop and squirt magenta pink juice everywhere if you try to pick them out. So fill a bowl of water and remove the seeds underwater. No magenta spray, the pips get rinsed and the membrane skin will float. Easy to scoop of the top, drain the pips and dry on a paper towel so they don’t get moldy on you. When we were kids, my mom would cut one in half and give it to my sister and I to eat. Often it took hours to eat and then we were stained magenta from head to toe. Outside activity, of course. Pick one or two up next time you see any and play. Delicious and fun! Pomegranates are in season here in South Africa. My tree at home is heavily laden with ripening fruit. A spoonful of seeds at the botton of a shot-glass filled with Tequila goes down really well. A fellow low-carber! Thanks for sharing your stories and recipes. Love the idea of blue-cauliflower! My favorite “faux mashed potato” is garlic parmesan cauliflower…yum! You can add blue cheese to almost any recipe and I’ll declare it delicious even cauliflower. Thanks for the recipe. 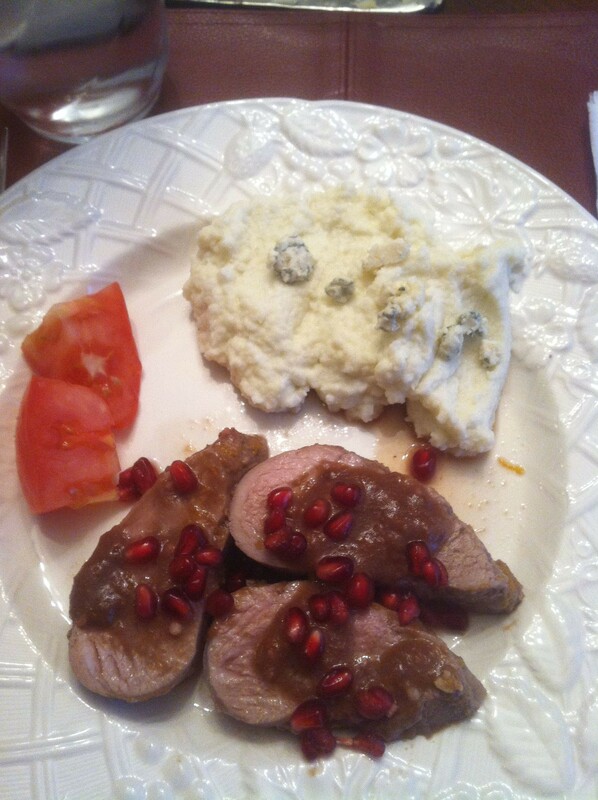 I am in love with the mashed cauliflower idea! I think I am going to try and make it with a different cheese, but still, thanks for the idea. I do love my pork dishes, I’ll give this one a try! Hi, thanks for liking my most recent blog post, it’s nice to meet you 🙂 This recipe sounds great. I don’t think my husband would eat the seeds anyway, so I shouldn’t have to look far for ingredients! I have a pomegranate tree in the garden but it doesn’t look very healthy. Would love to get fruit from it. I have seen only one fruit so far. Need all the help I can get with it. Never thought of mashing cauliflower. Will give it a go. Mashed blue cauliflower is pure genius, what a beautiful meal. I am so glad you visited my blog or I might never have found yours. What a find. It’s interesting, enthusiastic and the food looks so delicious. We’ve got a little Pomegranate’s tree on our terrace in Prato, Italy. It’s really nice…but sometimes they come out a bit sour! Thank you for your “like” notification on my blog! Hi! Thanks for “liking” my most recent blog. I hope you’ll come back again to check out more of my travels and musings. I’m excited to discover your blog – I love all things food related and my love of cooking has been developing over the last three or so years. I’m always looking for new ideas. So thanks! This looks great! I’ve always been a bit intimidated by pomegranates, but I might have to try this. Your recipes look AMAZING. I never would have thought of that combination. Thanks for stopping by my blog and liking my country cured ham and Brussels sprouts recipe. I look forward to trying some of your recipes! !